36. Being on the level about Prehistoric Masons. I am going to tell you a secret. It is older, deeper, and infinitely more real than anything dreamt up by Dan Brown. Granted, it involves masons, pyramids, and ancient secrets, all the usual suspects. But don’t be alarmed, I am a field archaeologist, and we dig through the brown stuff all the time, and dark forces tend to cross the street to avoid us. The use of the word secret to describe undiscovered archaeology is nothing more than as simple truism, but it serves to heighten the sense of mystery, which I am happy to invoke in a spirit of ironic, but gratuitous, hypocrisy. he initial trowelling of the site, by our inexperienced local crew fresh from the job centre, produced the usual assortment of horseshoes, nails, pottery, glass, buttons, suspiciously shaped stones, and a milk bottle top. This latter item went in the finds book as ‘AU object’, and nothing more was said. 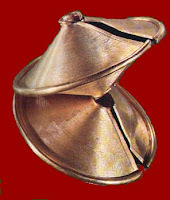 It was a crushed Bronze Age lock ring, solid gold. It was over 20 years ago, but I am still not going to mention where this dig was; so yes, like all professionals, we exercise a degree of discretion with our knowledge. As for wider secrets, conspiracies, and freemasons, let us just say, working in archaeology I have had the occasional unexpected glimpse through doors that are usually closed, but have been left slightly ajar, probably for my benefit. There have always been secrets. People have always met in private to make decisions affecting the lives of millions, or to decide who gets the contract for the old folks home. I’d be worried if they weren’t. Civilisation has by and large been run in the interests of those with the power to influence its course. The trick is getting the rest of us to go along with it. Clearly, many societies and religious orders, and their rituals, secrets and other knowledge, have roots deep in the past. Most things do. It is from this self-sustaining belief that they derive much of their credibility and influence. But archaeologists can dig deeper than that, back before books, back before the One God, to a world where men had never seen a written word or wood cut with metal. Since all but the most ardent will have looked at the pictures and stopped reading by now, you have passed the first trial, and may consider yourself ready to climb the seven wobbly steps of the stepladder that leads to the securely scaffolded platform of structural enlightenment. TSA is a path yet un-trodden. 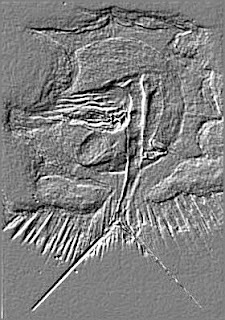 In the coming months we are going deeper into a whole new world of prehistoric architecture. I have scouted a long way ahead, and I think I know where we are going, and the preceding 35 articles were written with that in mind, to prepare you for the journey, so you have been warned. There are a group of skills that encompass building, engineering, logistics, and surveying. They are concerned with the conceptualisation of space, its measuring, and its reorganisation. At their heart is mathematics, and in particular, geometry, something that goes well beyond basic numeracy. A farmer, 7000 years ago, needs to count his stock, quantify his produce, barter, and understand the logistics of his farm. But geometry is something else. 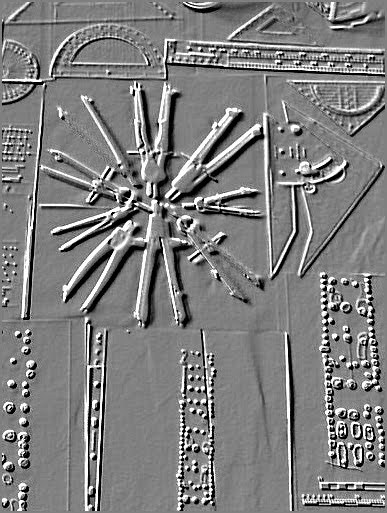 Theoretical structural archaeology studies the foundations of buildings and structures, and central to my understanding of these constructions is that they were conceived in the mind of a group of people working within a very specialist craft tradition. Only a small group within society would have the necessary skills in maths, geometry, and engineering to create roofed and other spaces with any degree of accuracy and consistency. TSA endeavours to study the culture of these people, and it is as much about prehistoric builders as prehistoric buildings. It is not about the occupants and users of the built environment, although inevitably understanding the nature of these spaces does illuminate something of the wider culture. Each part of the process can be broken down further, and may require different craftsmen with specialist skills and tools. If we include cultivation time for the trees, the process, as a whole, has a complex timeline involving more than one generation. However, this type of archaeology is focussed on the person whose mind had the necessary skills to conceived a plan marrying the client’s aspirations with the available resources, and then lay it out on the ground. 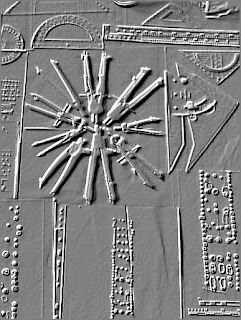 The plan of a building like Longbridge Deverill II [above]  is a product of a mind with probably no direct relationship with the material culture found on the site, While it reflects the site's occupants’ aspirations and resources, the plan is probably a local import. These plans represent artefacts whose scale and cultural significance puts them in a class of their own, a class we call architecture. originated in the mind of an architect, and was implemented by a builder, or even a carpenter in the case of a timber building. The main issue is one of vocabulary and identity. I prefer to use architect for the person who conceived the plan, rather than builder. Beyond this we need make no further judgement about job description, division of labour, or status. The word mason is attractive, because of, rather than in spite of, its overtones of secular brotherhood, secrecy, and hidden knowledge, since this model conveys how important craft technology can be preserved and maintained within society. The connection between masons and stone, and their wider development as a fraternal society are, in archaeological terms, recent and irrelevant developments. Father to son, master to apprentice, crafts are handed down. As archaeologists we have no problem conceiving of ‘smiths’ as specialists. However, ‘masons’ played a much older, and more fundamental, part in the creation of material culture. We take it for granted that, when the winds blow and there is a metre of snow on the roof, our house won’t fall down. It is important we trust our buildings and builders; it is vital for the long-term health of both parties. Building is simple in this regard; you build this one in the same way as you built the last one, because the last one still hasn’t fallen down. In fact you will probably do it the way your master taught you, and this is the essence of a craft tradition. Machines and regulations have replaced experience and rules of thumb. Importantly, you can experiment with architecture, model ideas, refine designs and push boundaries with confidence; it won’t fall down because the machine says it won’t. By contrast over-design and conservatism would be the stock in trade of our ancient builder. You can’t afford to mess with gravity; it’s dangerous. People can survive under quite primitive and extreme conditions, but not always through choice. Soldiers, prisoners, and poor people in general often have little choice in their living conditions. People who had the bare minimum may be of little interest to a structural archaeologist, since they leave little trace in the built environment. It is a sad but simple reality that the architects I study worked for those with the resources to require one, and in this respect I am no different from any other student of architectural history. Given the choice, most people would prefer their accommodation to be warm, dry and secure, but the power to choose is usually a measure of wealth and the power to control other people. We call people with this power to choose, Elites. Civilisation was built on adapting the environment to mass-produce food, with architecture and the built environment being a key component in this process. Once elites gained control over the food supply, they put its surpluses into all manner of novel enterprises. 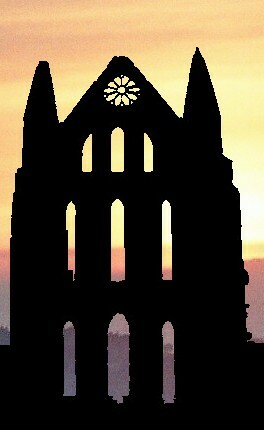 This usually unleashes Architecture, with a capital ‘A’, into the world. Buildings continued to be built because they were needed for ‘ordinary’ people and purposes, but architects started to create buildings and structures for people who were determined to prove that they were anything but ‘ordinary’. Clients wanted out-of-the- ordinary, taller, wider, bigger, and Architecture with a capital ‘A’ was happy to oblige. 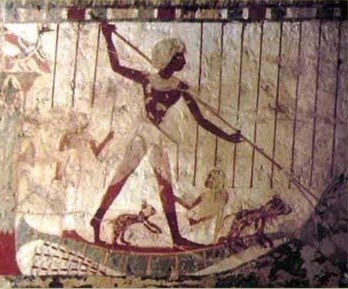 A painting from the 18th dynasty tomb of Userhat, an administrator, shown fishing. Hunting /fishing is a favourite leisure pursuit of Elites in agriculture societies. The history of architecture is largely the study of what survives, and building in stone is an essential prerequisite if you want posterity to admire your architecture -- Certainly if you want it to visit. It was lucky our ancestors in Northern Europe had the good sense to stick a few stones upright in the ground just to prove they were human. 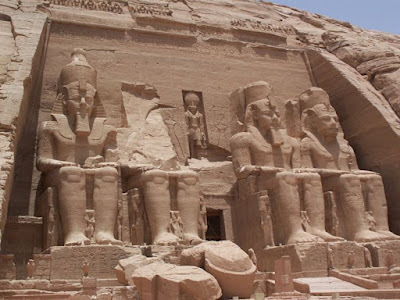 Architecture sells, and if you want to pick a favourite ancient civilisation as a travel destination, Egypt ticks this, and most of the other, boxes. So our conception of ancient architecture is naturally drawn from those places like ancient Egypt, where stone was available and used, and architecture, as a practice in wood and earth, fades into a hazy background. The narrative of architectural history woven around these somewhat atypical and often eccentric monuments of Egypt has to be set against this vast and unimaginable backdrop of absence. I don’t think Egypt as important as Mesopotamia in the wider scheme of things, but like so much of the ancient world, Mesopotamia used mud brick architecture, so there is not much to see. The same is actually true of Egypt; most buildings would have been mud brick, a shortsighted economy, if you want people to admire your pyramid in 4000 years. It is in Egypt that we first see historical figures whom we can clearly identify as architects, or at they least claim to be. 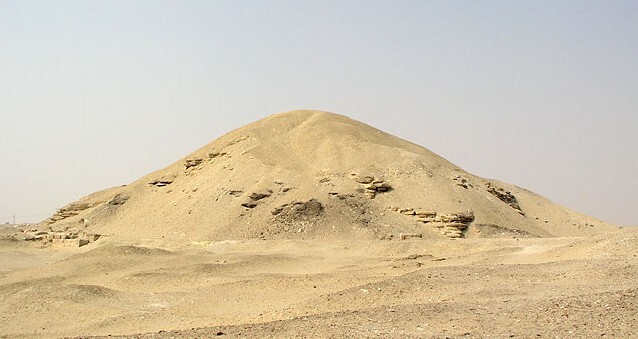 Characters like Hemiunu, architect of the Great Pyramid, were members of the wider royal family. As Vizier to Khufu he had a range of titles. He could be just some bloated aristocrat taking credit for the work of others, but it would be nice to think he was an architect. 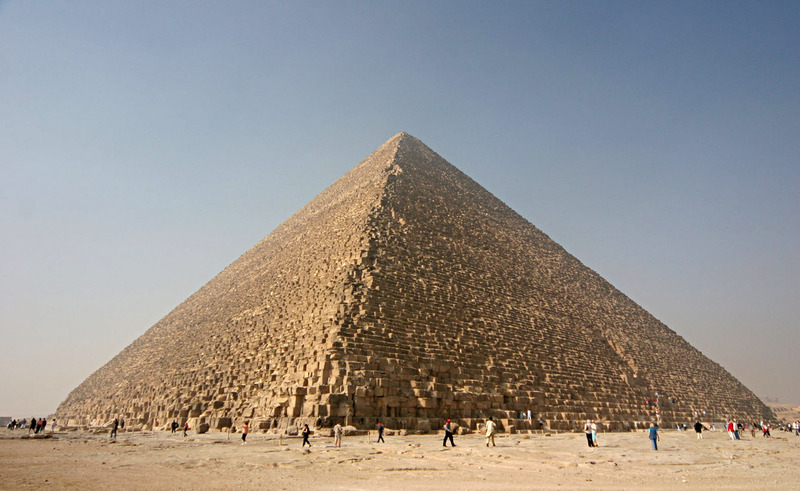 Pyramids are an extraordinary architectural achievement, better known for the pharaohs who extracted the resources to build them rather than the architects who conceived them. It really does not help to dwell on the nature of the societies that created these extraordinary monuments. Pharaohs, the rich and powerful celebrities of their day, with bigger architecture, pretty tombs, and lots of shiny things, still fascinate; they are still box office. But you not want to be owned by one. Then again, this may have been considered a lucky break by a slave at the time -- tricky thing, anthropomorphism. If it could be arranged, I would have all students and staff in archaeology departments dumped in a remote wood in the middle of the night. I would then get the local rugby team, suitably inebriated and armed with bronze weapons, to chase them around for as long as it took them to understand the nature of fear; it has archaeological implications. "The Praefect of the camp, though inferior in rank ..., had a post of no small importance. The position of the camp, the direction of the entrenchments, the inspection of the tents or huts of the soldiers and the baggage were comprehended in his province. His authority extended over the sick, and the physicians who had the care of them; and he regulated the expenses relative thereto. He had the charge of providing carriages, bath-houses and the proper tools for sawing and cutting wood, digging trenches, raising parapets, sinking wells and bringing water into the camp. He likewise had the care of furnishing the troops with wood and straw, as well as the rams, onagri, balistae and all the other engines of war under his direction. This post was always conferred on an officer of great skill, experience and long service, and who consequently was capable of instructing others in those branches of the profession in which he had distinguished himself." Here we see a broad range of skills, logistics, surveying, architecture, and civil and mechanical engineering all coming under this general brief. They are primarily to do with space and its manipulation, which, as we have suggested, is the core area of expertise we envisage for our prehistoric ‘masons’. One aspect of the Romans' military dominance was that the army out-engineered their opponents, manipulated the battlefield environment more systematically, and overturned age-old tactical certainties, particularly in siege warfare. While they developed the tactical use of military engineering to a new level, they did not invent it; they were just better at it. If you wish to enclose space for the security of its occupants, you can plant a hedge, dig a ditch, or pile up a rampart, but at some point you need a secure gate -- wide enough for a cart. Hands up, all those who know how to build a fortified gateway . . .
We live in a world of prefabricated mass produced building components, although much architectural kudos come from disguising this. 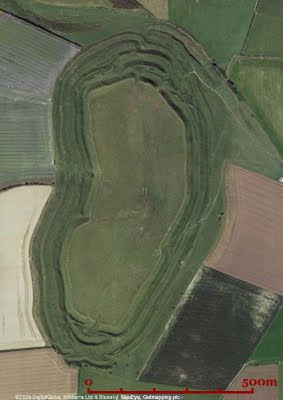 This makes irregular holes in the ground hard to conceive of as architecture. 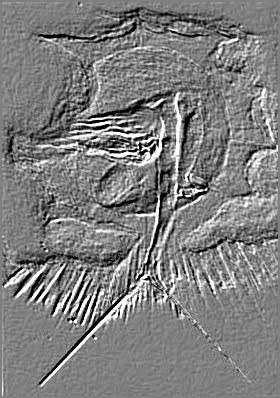 I have discussed a number of reasons that the plans of prehistoric buildings may seem to be irregular, most of which relate to the tapering nature of trees. 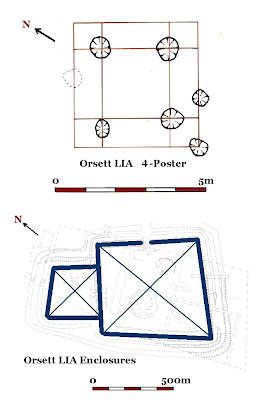 In the next article we will look in more detail at this issue in relation to early Neolithic longhouses. 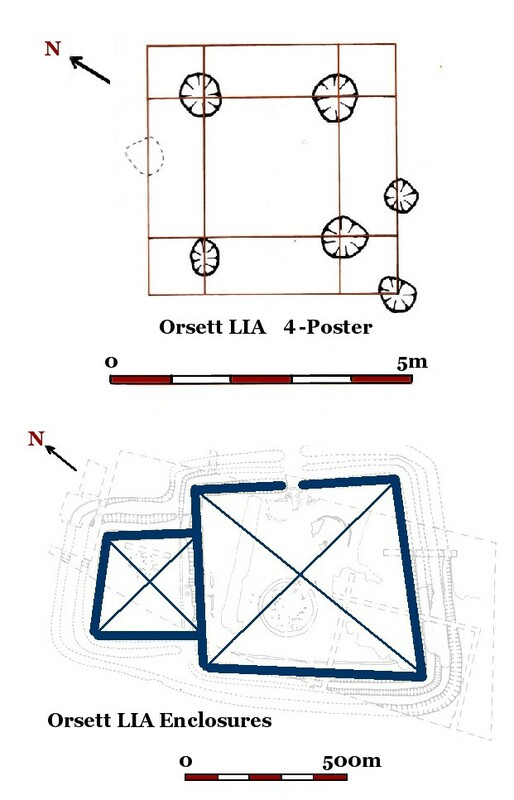 I am unclear how this early seeming irregularity relates to “Systemic Irregularity,” discussed in my article “Why nothing in the Celtic world was square”. As you will recall, I drew attention to the fact that nothing in the built environment in the 1st millennium BC was square, apart perhaps from temples, important graves, and sacred sites, suggesting that rectangularity and square-ness were somehow taboo, except where it delineated the boundary between profane and sacred space. However, if one group of individuals with a shared tradition were responsible for most aspects of the built environment, this would explain why a phenomenon like systematic irregularity was so widespread. The master/apprentice or father/son provides a perfectly satisfactory system for transmission, and the ‘masonic’ model provides a reasonable social context for the wider preservation and development of this knowledge base. Both are familiar in a traditional context for building crafts in this part of the world. While archaeology often revolves around rooting in rubbish and residues, the key to understanding to this material is context, and postholes, often left unexcavated and unresolved, were, by and large, the raison d’etre for the refuse. While I am in no way suggesting that these features are simple to interpret, the crucial point is they are not random, nor are they ritual, they are the product of individuals with a degree of structural literacy. Which is what is required if you wish to interpret them. So there you have it, the great truth: The formal landscape of prehistory, its manmade backdrop, was mostly initiated by a small group of individuals working in an ancient craft tradition. 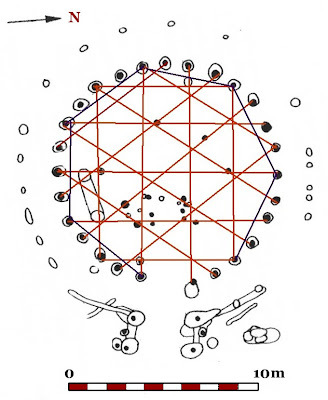 Their activities are responsible for a significant proportion of the features recorded by archaeologists, and they are the human subjects of theoretical structural archaeology. Since we meet via the Internet, you will have to organise for yourself whatever additional oath swearing, blindfolding, flagellation, and sundry threats of dire consequences, you think appropriate on these occasions. However, to avoid any chance of PSD, and to you test your new conditioning, may I suggest you lie down in a darkened room and practice the following mediation exercise? 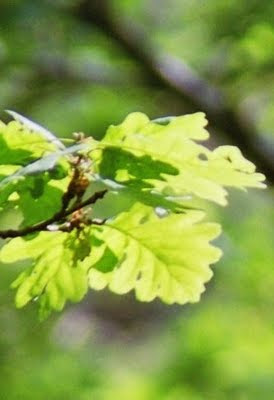 I want you to relax take a deep breath and imagine it’s a late summer afternoon, you are sitting quietly in a wood,- NO! - Don’t close your eyes yet – beneath the tall thin oak trees. A barely perceptible breeze stirs the warm air, momentarily scattering a multitude of insects. You are a farmer reflecting on how you have been blessed by more than your fair share of fine weather and good harvests in the last few years. Your cows are famous locally for the quality of their milk, and you are regarded as something of an expert on all matters bovine, at least in the small valley where you have lived all you life. Fifty feet above you the wind is rustling the canopy, where an unseen chorus of small green birds keep up a clamorous high frequency fugue. Higher still, the wind is chasing ragged clouds across the sky, dappling the late afternoon sunlight, sending shafts of brilliant illumination cutting through trees, backlighting the leaves below in fleeting moments of viridescence. Luckily, you have two fine woods, including many hundreds of trees tended by your grandfather, that are ready for harvest. You have maintained the hazel under-storey, partly with this day in mind, and there is a fair amount of good straw put by for the thatch; all in all, it is a good time for a new farmhouse. Besides, nobody else in the valley has had one for years ... Well, not since the year after the Great Storm. Getting up, you shoulder the axe of ground basalt that you use to chop firewood, and taking a final reassuring look at the hundreds trees, you head for home, the matter of the new longhouse resolved in your mind. So, who you going to call? None of this is true, but 7 steps is appropriate. 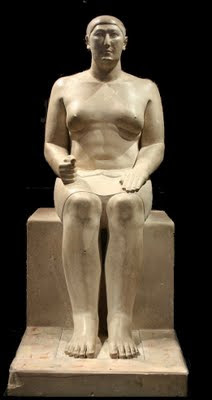 Userhat was "royal scribe", “Overseer and Scribe of the Cattle of Amun", “Bread counting scribe in Upper and Lower Egypt", and "deputy Herald"
Statue of Hemiunu – Photo by Einsamer Schütze. The statue currently resides in the Roemer and Pelizaeus Museum in Hildesheim. This is amazingly erudite and educational. Thanks so much for posting all this, it's really useful! Thanks Gary, it is easy for classicists to take geometry for granted, you have so much of it, but we barbarians needed a little bit too! I could have discussed the word tekton / architecton, etc, [but I would have had to mention JC, etc], and you can have too much of a good thing. Too true - setting up camps in Britain, you had better hope that your ‘Praefect’ was good at drainage and sewage provision, or you would soon be living in a stinking mire.